If you've ever wanted to make a great side dish or appetizer, this is it! 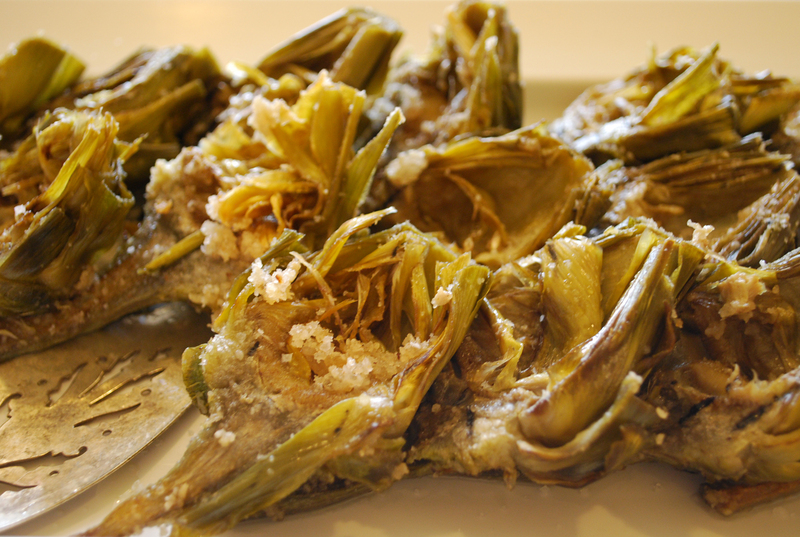 An authentic fried artichoke that's easy to make. Follow these simple directions and let us know what you think by posting pics on our Facebook page. Ready for a mouth-watering delicious crispy treat? Try one of these tantalizing fried artichoke hearts! The Italians aren't sure how old the recipe is, saying it could date back to Imperial times when the Roman Jewish community had upwards of 50,000 members. We started by cleaning the artichokes, cutting off the bottom of the stem and the tough outer leaves. You will end up removing about half of the leaves to get to the tender inner section and may want to trim the sharp tips of the remaining leaves, as well. Cut the remaining heart section in half, dip in lemon water, then drain on a paper towel. Mix together in a bowl: some matzoh meal, salt and pepper, then coat the hearts on both sides. Heat at least 1/2" of olive oil in a saute pan and when hot, quickly saute some chopped garlic and then scoop out so it doesn't burn. Now gently drop your artichoke hearts into the oil, turning them so they cook evenly (about 3-4 minutes) until they're golden brown. Set on a paper towel to remove excess oil and enjoy! !